Used only during the Pop era. [This article on the making of Marr's 2018 *Call the Comet* album by MixOnline.com](https://www.mixonline.com/recording/johnny-marr-finds-his-voice-on-call-the-comet) touches on some of the gear used during the recording process. "The use of pedals on all the instruments is prevalent on Call the Comet. Marr favors Carl Martin pedals for their musicality: Delayla for delay, Plexitone for distortion, AC-Tone for overdrive. He also likes Lovetone’s Doppelganger, Ring Stinger, Brown Source and Big Cheese for more extreme modulation and flange effects." According to his "gear list", Robertson uses the Lovetone Big Cheese pedal. 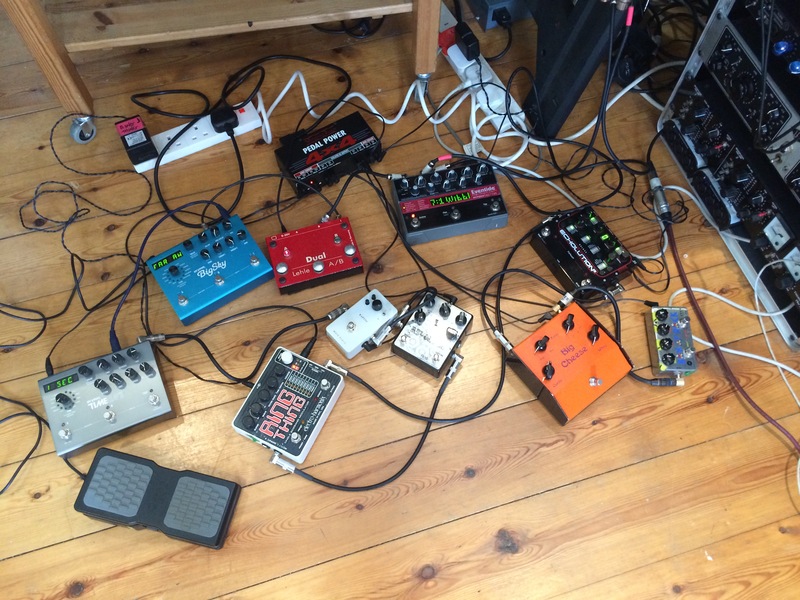 Ed's pedalboard (the right one) contains a Lovetone Big Cheese effects pedal. [Source](http://acltv.com/2012/10/10/gear-blog-radiohead/). The Lovetone Big Cheese pedal is seen here in this picture. 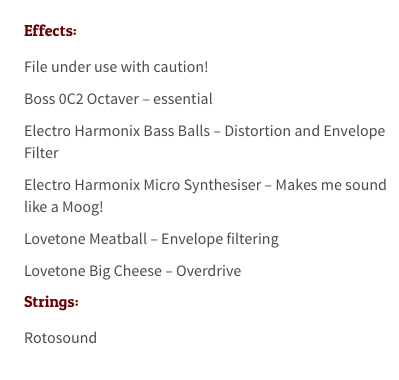 On Steve Hackett's official [website](http://www.hackettsongs.com/instrument.html), he lists the Lovetone Big Cheese fuzz pedal as one of his pedals. According to Omega auctions, he also auctioned off 4 Lovetone pedals - with one being "Big Cheese". 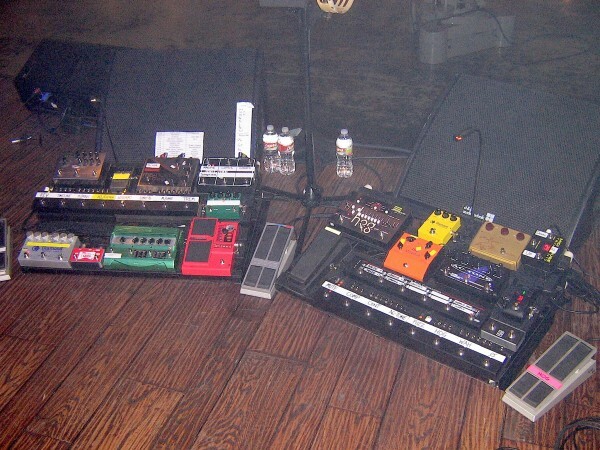 The image from the pedalboard dates back to 2004 Toronto concerts, and original poster of pedalboard photos can be found [here](https://forum.guitar.com/complete-rig-25/wilco-2004-164006). Also, photos of the concert that this pedalboard photo is from can be found [here.](http://www.chromewaves.net/concertPhotos.php?concertPhotosID=44). In this photo, the Lovetone Big Cheese can be seen. Jonathan Noyce states that he uses a Lovetone Big Cheese pedal on the official [Jethro Tull site](http://jethrotull.com/the-attic/musical-instruments/jonathan-noyce/). The Lovetone Big Cheese can be seen in their instagram pic here in the top left. In this picture of Nick's touring rack you can see the Lovetone Big Cheese at the back right of the slide out drawer (B Show Rack). Here is the actual link as equipboard.com thinks its a bad link.... http://www.thecustomrackshop.com/#!Nick Wheeler from the AAR A&B Rigs/zoom/ce11/image7gk It is generally accepted knowledge that Nick uses a Big Cheese (many references to this especially on his wiki page which was recently removed. I infer that this is the pedal in the rack due to this knowledge and its distinctive colour/size compared to the Ibanez TS808 in front of it. From reverb.com - https://reverb.com/item/475444-lovetone-big-cheese "Super rare, super low serial (no. 16) , fuzz at its finest, just look at the user list: Nick Wheeler of The All-American Rejects"
The BIG CHEESE™ is a loving homage to the nasty, buzzy yet gorgeous and harmonically rich early fuzz. While having many of the classic characteristics that every fuzz fan will relate to it goes beyond to create an absolutely distinct character of its own. Its innovative and interactive controls can take it from almost "gated" break-up to overkill of shred proportions. Far from being just a guitar pedal however the Big Cheese™ is eminently useful for seeing to any sound with the temerity to be naff or boring (with particularly amusing consequences in the lower regions). To lovers of that extraordinary spectacle known to some as "furrrzze bass!" 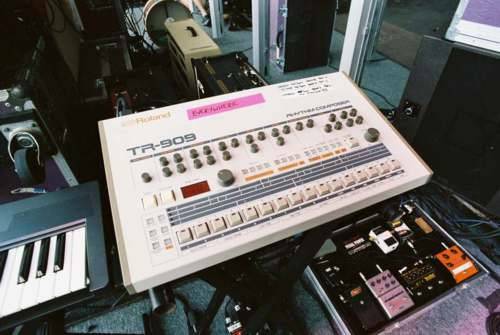 it offers terminally thunderous, ripping yet glitch-free and buttock-clenching mayhem that can only be described as Larry Graham on steroids (as demonstrated to devastating effect by the man himself!). The Big Cheese™ works exceptionally well in the fx loop of the Meatball™ creating some of the squelchiest curdled sounds ever - particularly true of the "cheese" setting which gives the signal huge dynamics thus cutting through a mix like the fattest, raspiest analogue synth. Coupled in this way with an octaver it can perform an uncanny impersonation of a guitar synth with no delay or tracking worries. No reviews or videos yet for Lovetone Big Cheese. With an Equipboard account you can rate this item, add it to your collection, submit a review to discuss what you like and dislike about it, and associate Lovetone Big Cheese to artists that use it. Create an account!